Find the best traveling & shopping deals and inspiration for spring and summer 2015 with these Top 10 sites. It’s finally April. If you live in an area of the world that’s had to suffer through snow, darkness and cold for the past few months, that’s good news. The sun is shining a little bit brighter, the days are getting a little bit longer and it’s time to get out of your house. 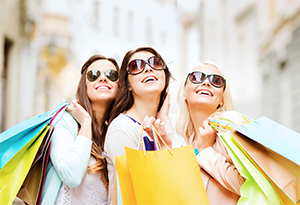 With spring in full swing and summer on the horizon, you should have two things on your mind: traveling and shopping. Traveling and shopping are two different hobbies, but they go together well. You can’t go on a vacation without taking home at least one or two souvenirs, and technically a trip to the mall still involves some form of “traveling.” That might be a convoluted way to explain why we’ve combined Travel & Shopping in this list, but the reason isn’t necessarily important. These 10 sites all fit with one of those two themes, but each offers something new and exciting. From discounts on hotels to travel and fashion inspiration, these 10 sites are packed with tons of awesome content that will make your next trip that much more awesome. Even if your next trip is just to your computer desk in order to buy some clothes. It’s ok – you need a new outfit for the warm months, anyways. Enjoy this Top 10 list. Adventure is a travel inspiration site that encourages people to break out of their comfort zone and make their next adventure a reality. The site helps adventurers around the world connect with each other and share their experiences. Anyone can write a story about their adventure experiences on the site, whether that means taking a photography trip nearby, trying new food, or climbing Mt. Everest. 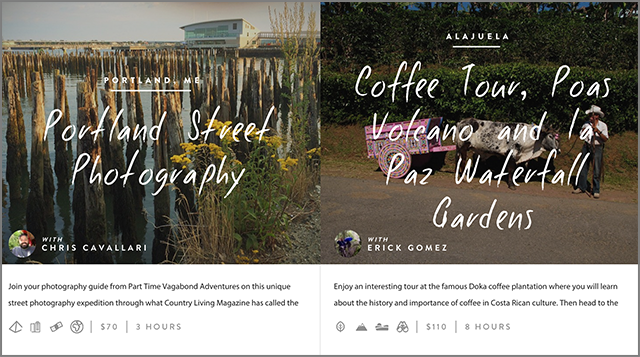 Adventure also doubles as a booking platform for awesome experiences around the world. You can book unique, exciting adventures directly through the platform, and those providing the experience include a ton of details and photos in order to ensure that people make the right choice. We’re more than a quarter of the way through 2015, but it’s never too late to make your adventure a reality before the year ends. Roomer is a marketplace for hotel reservations. The way it differs from other hotel booking platforms like Kayak is that it connects travelers with rooms that are going to be unused by those that initially booked them. On the other side of things, it also offers a way for people to avoid cancellation fees by selling their rooms. All you have to do is submit your unused reservation to Roomer, then get paid when someone books it. It’s an amazing way for travelers to find cheap, last-minute deals, and it ensures that room bookings don’t go to waste. It’s a cool alternative to traditional hotel booking services, and worth checking for anyone planning travel (or planning on canceling travel) in 2015. Inspirock is a vacation planning tool offering daily itineraries for trips in more than 6,000 destinations across the United States and Europe. The itineraries are fully customizable based on location as well as your personal interests. You can tailor recommendations based on your favorite vacation activities, the dates you’ll be traveling, and the specific city or general area that you’ll be visiting. There are pre-made plans, but you can edit them as you see fit. It’s a truly invaluable resource filled with advice and inspiration for anyone traveling to an unknown destination. Secret Escapes is an online community offering hand-picked deals at hotels in the US, UK and around the globe. In exchange for your e-mail address, you’re granted access to Secret Escapes’ exclusive club. That shouldn’t be too much of an issue, especially considering almost every site requires some sort of e-mail or social media login these days. Still, by limiting its offers to its members, Secret Escapes is able to offer deals at up to 70% off at major luxury hotels in major cities around the globe. The site continuously runs short “flash sales,” allowing users to act quick and book great deals on rooms anywhere they want to visit. When you think of shopping, 3D printing probably isn’t the first thing that comes to mind. But 3D printing is the future of shopping. It’s the future of everything, if you’ll believe the pioneers of the still fledgling hobby/industry. But Pinshape is definitely a shopping site, allowing you to quickly and easily find designs and products that you wouldn’t be able to find in stores. The site sells the designs directly from those who created them, having them printed and delivered to your door or sent to your own 3D printer. There are tons of creative inventions listed on the site, so it’s worth browsing even if you’re just remotely interested in how 3D printing works. Stayful has reinvented the process of booking boutique, independent hotels. Rather than giving you a certain discount or price, Stayful lets you negotiate by offering a bid on the price. The hotel then decides whether or not they’re willing to accept the price. They can also present a counteroffer. The process is typically quick, making the overall booking process more fair and equitable for both sides. It’s similar to the original Priceline model, but there are no major hotel chains to be found on Stayful. This makes it a better way to find unique places to stay that are off the beaten path. Consider staying in a boutique hotel during your 2015 travels. Atlas Obscura is a user-written travel website that highlights the lesser-known, awesome destinations and locations around the world. It’s essentially a travel guide, but it recommends visiting sites that you probably won’t find on TripAdvisor or Lonely Planet. 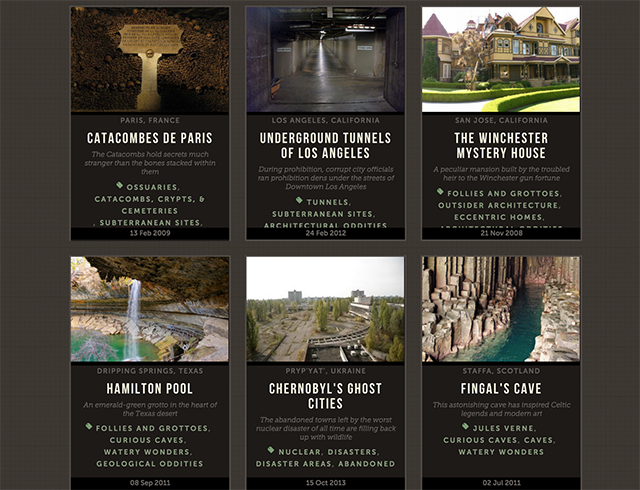 Locations around the world are profiled, like the Pottawattamie Squirrel Cage Jail museum in Council Bluffs, Iowa and Fingal’s Cave in Staffa, Scotland. It helps you find things to do and see in unsuspecting locations around the globe. Like Stayful, Atlas Obscura is the perfect site to add to your Wibki if you’re planning on venturing off the beaten path during your next vacation. 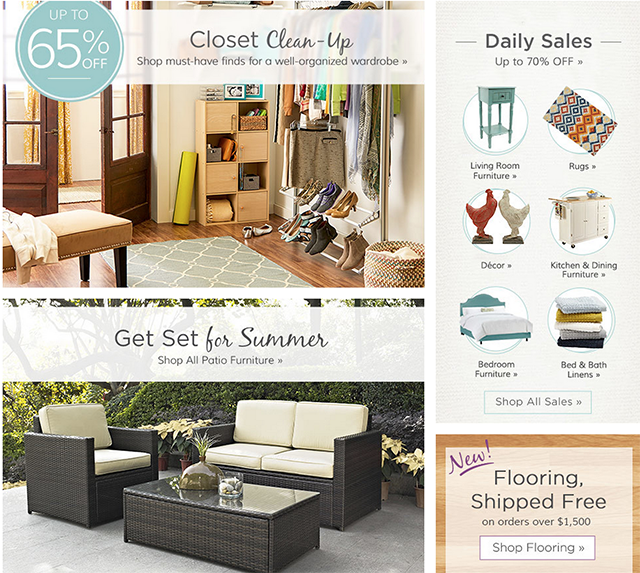 Wayfair is an online marketplace with thousands of home goods products. It’s the online equivalent of a store like Bed Bath & Beyond, offering furniture, kitchen supplies, home décor, lighting and items across many more categories. Many of the items are larger-scale and more expensive, but the site offers quick and free shipping and delivery on orders over $49.00. If you’re planning on shopping online for anything related to your 2015 home improvement projects, Wayfair probably has what you’re looking for. 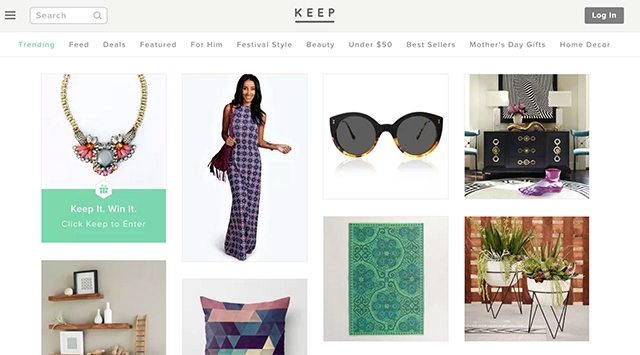 Keep is our top website recommendation for avid shoppers of clothing and accessories. The site displays images of tons of products on its homepage and across its major categories, allowing users to scroll through and check out products that they like. You can “Like” items, “Keep” them saved to your account, or buy them with just a few clicks. There’s also a social element to Keep, allowing users to share recommendations with each other or for tastemakers to share curated lists with their followers. 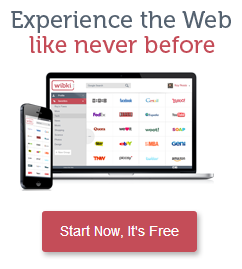 The site is visually similar to Pinterest, and it offers a surprisingly simple and effective method of discovering cool products available for sale around the web. Massdrop offers a communal shopping experience. While most sites force competition amongst their users — like eBay requiring shoppers bid against each other on products or GILT forcing users to act quickly or miss out on sales — Massdrop lets the community buy products together. Massdrop users discuss and then vote on the items that they want to buy, ultimately ordering it in bulk directly from the manufacturer. This ensures that the price is kept lower than you could find it in retail stores. It drops lower and lower the more people sign on to a user-created poll. It’s an unusual way of shopping, but it can have great price-saving benefits without the unnecessary competition. Maybe it’s time to start shopping differently in 2015.